Emory bariatric patient Jim Blackburn finished the Peachtree Road Race in 1:07.57, a feat he's worked toward since his gastric bypass surgery two years ago. Two years and 215 pounds ago, Jim Blackburn's knees and ankles hurt just carrying his own weight. Now, he can count himself among the thousands who have completed Atlanta's time-honored Independence Day tradition, the Atlanta Journal-Constitution Peachtree Road Race. Born at what is now called Emory University Hospital Midtown, Blackburn returned there on April 5, 2010 to receive his second lease on life through gastric bypass surgery. At his heaviest, Blackburn weighed 420 pounds and suffered from high blood pressure, sleep apnea and was in the early stages of diabetes. Though he knew having the surgery would change his life, he never considered that it would help him reach one of his lifetime goals. "Completing the Peachtree Road Race has been a goal of mine for as long as I can remember," says Blackburn. "I never thought I would be able to do it before April 5, 2010. It's one of those things that when you're morbidly obese you just say to yourself would be nice to do, but just can't. As I started to see my body and stamina change after surgery, completing the race came into vision as an achievable goal that helped motivate me to stay on track with my total program and plan." On the day of his surgery, Blackburn weighed 384 pounds. Now, almost two years later, he's at a healthy 205 pounds. He no longer needs blood pressure medication, and his sleep apnea and diabetes symptoms are no longer an issue. Blackburn credits running and consistent exercise with his success. "When combined with positive lifestyle changes, weight loss surgery is a tool that can be a game changer for people who are obese," says Ed Lin, associate professor of surgery at Emory University School of Medicine and director of the Emory Bariatric Center. "Jim is a role model for patients considering weight loss surgery because he has committed wholeheartedly to a healthy and active lifestyle." 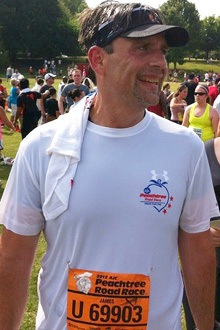 With the Peachtree Road Race behind him, Blackburn's next goal is to train for and complete a sprint triathlon. "I believe keeping goals out in front of me will help me to continue to improve my health and to avoid reverting back to a place where I just do not want to go," says Blackburn. "This is just the beginning."